Trying to wrestle with freezer bags can be a pain at times, especially when you are working with gallons of peas and other produce. 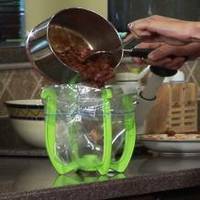 This baggie holder makes filling your gallon size bags with corn, pasta, nuts, and more a breeze. Use it as your extra set of hands and fill bags faster than ever with less mess. Rotate the arms of the bag stand holder in an *X* shape to create a sturdy stance with the curved posts at the top. Fold over the top edge of a one-gallon storage bag to create a lip on the top edge of the bad. Put the storage bag in the middle of the baggie stand and slide the lip over the 4 upright posts. Fill your freezer bags with peas, beans, creamed corn, peppers, berries, pasta, snacks, soup, toys and more!